My Big (Broken and Bitter) Heart. For those of us who, at least in our minds, have consistently chosen to be kind and received unkindness in return. This one is for you. An instagram user replied to one of our posts expressing she once valued the perseverance of love, but had gotten to a point she could not get over all the hurt. I am more than familiar with that sentiment. So am I crazy to try to convince her otherwise? This one is for her. When describing me some people say “you have a big heart!”. They say I have a warm smile. Others might disagree. Others have experienced a coldness that comes from my walls. These walls were built to protect an already broken and fragile trust from unsafe people. Dr. Cloud and Dr. Townsend’s book “Safe People” addresses the matter of unsafe relationships. These include abandoners, critics, demanders, abusers, defensive people, liars, and deceivers—all of which I have experienced and some of which I have been. I then had to develop into setting boundaries. Walls kept unsafe and potentially safe people out, and locked me in. Boundaries clarified for others what my basic relational expectations were, and freed me to choose kindness regardless of what I receiving. 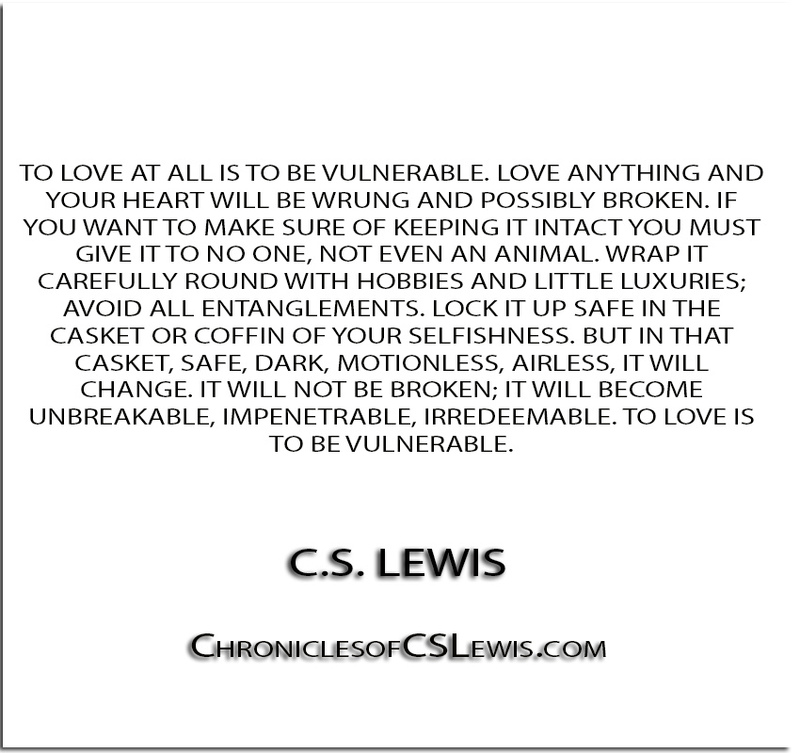 This has been a hard concept for me (and others I know) to grasp because it would seem love has no boundaries. But experience and the bible teaches that we must be wise with the issues of our hearts and that we cannot entrust ourselves to just anyone. We cannot experience intimate love with everyone. Love is that delicate space between watching and choosing to trust. Guarding our hearts and choosing to be selfless. Protecting our context and choosing to be vulnerable. Love is not blind. Love is very aware. That is what makes it so amazing—that we can see each other whether safe and unsafe, have compassion, know our human limitations, and still choose kindness and not hold grudges. After all, he loved us while we were strangers; we were enemies. Our Father was and is aware and he chose to love us. In the process, I’ve stumbled across wounds still healing from relational fallouts. Put another way, I’ve been bitter. Sometimes that is the outcome of having such a “big heart”. So I know the feeling of that instagram user. I figure my options are to keep all people out or to choose love with understanding. Understanding my limitations, understanding the nature of the relationship and understanding the risk. It’s easy to stay away. It takes courage to walk into a fire… It certainly is not for the faint in heart. This one is for me. Love this post! It does take courage to love. Relationships are like journeys into the unknown, traveling unpaved paths into hearts and lives of people. And, sometimes we get hurt in the process. But I always feel that all of my best relationships were definitely worth the investment I put into them. ‘This ones for me’ love it ☺️. But I can relate, unfortunately. But it’s part of life and you learn that walls are just the product of fear, but love cast out fear, so all we need is more love! Thanks for sharing, appreciate it!